Smithstown, Shannon, County Clare headquartered Clean Ireland Recycling has officially opened Ireland’s first Compressed Natural Gas (CNG) refuelling station outside of Dublin. The Minister for Communications, Climate Action and the Environment, Denis Naughten, TD., performed the landmark ceremony. This joint venture between Clean Ireland Recycling and Gas Networks Ireland will service Clean Ireland Recycling’s dedicated CNG waste collection trucks, the first of their kind in Ireland. CNG is natural gas which has been compressed to fit into a vehicle’s tank and is particularly suitable for use in commercial vehicles. A proven alternative to diesel or petrol, CNG provides the greatest cost saving and emission reduction benefits for transport operators. Speaking in Shannon at the launch of the station Clean Ireland Recycling’s Brian Lyons said that the investment maintains the company’s proud tradition in the industry as market leader nationally when it comes to introducing environmentally friendly solutions. “Lowering our carbon footprint is a priority for our business and for our customers. From the moment we started operations in the early 1990s, we have been a pace setter for the industry nationally in terms of introducing environmentally-friendly solutions, some of them ground-breaking nationally. The development of this CNG facility at our site in Shannon is right up there among them,” he said. 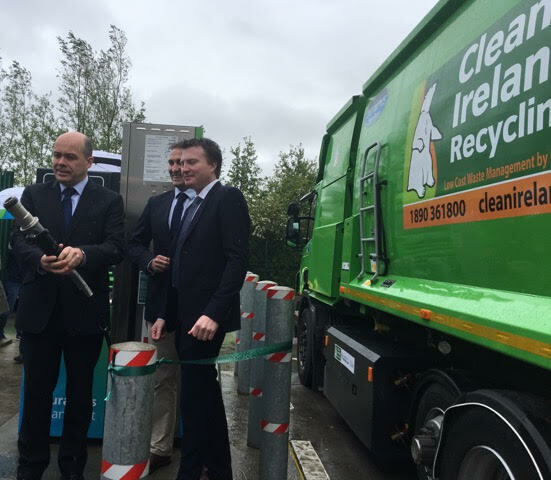 Denis O’Sullivan, Managing Director, Gas Networks Ireland added: “We are delighted to open the first private fast-fill CNG station here at Clean Ireland Recycling. Waste collection vehicles are notoriously energy intensive and Clean Ireland Recycling are proving their innovation and sustainability credentials by adopting CNG technology, and deploying the first CNG waste collection vehicles in Ireland.